The first inhabitants of these mountains were the indigenous Brazilians. There were no permanent European settlements in this region until the early 1700’s. The Portuguese crown was aware of gold in the northern area of Chapada Diamantina. By 1720 the government “legalized” gold mining, and this era lasted almost 200 years. By 1732 the Portuguese knew there were diamonds to be found, but mining for them was prohibited as they were afraid of Spanish intervention. 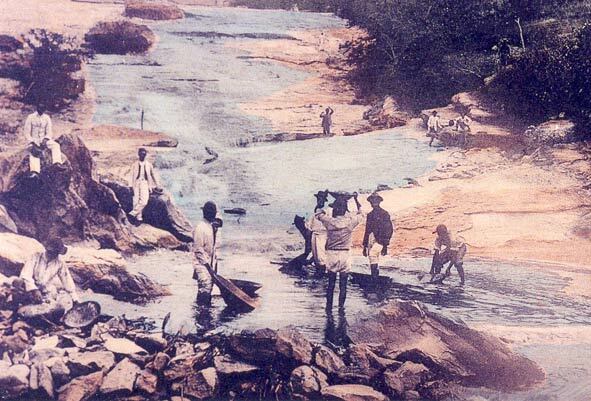 In 1844 a rich gravel of diamonds was discovered near the town of Mucugê. The diamonds attracted a lot of adventurers, cowboys and criminals. Lençóis, Mucugê and Andaraí were the most important booming diamond cities. A french consulate was even built in Lençóis. But by the late 1800’s the diamond boom had lost most of its steam. As a result most of these towns fell into decay.